The Comey Clinton cover up continues as the House Oversight and Reform Committee interviews a panel of A representative of the FBI suggested to members of the House Oversight Committee during a hearing Monday that they file a Freedom of Information Act request for documents related to the bureau’s investigation of Hillary Clinton’s private email use. FBI Director Comey has refused an invitation to attend a classified briefing on the failure of the Bureau to provide Congress with access to documents resulting from the year-long investigation into Hillary Clinton’s illegal secret server. Committee Chairman Chaffetz then called a public hearing with Comey’s subordinates in a panel to attempt to force some transparency from the agency that is clearly engaged in a full and complete cover up of not only the actions of Clinton, but of their own as well as the DOJ. The whole nest of corruption that is mislabeled as the Department of Justice is now clearly first and foremost an arm of the Obama political machine. 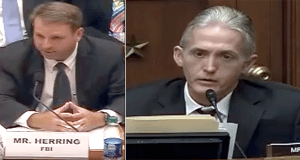 Rep Trey Gowdy questioned Jason Herring, who is Acting Assistant Director for Congressional affairs at the FBI, about the information and documents that were provided and those withheld. Herring reveals the effort to selectively release information to Congress based upon the agency’s determination of what they may be allowed to know. A significant amount of the debate surrounds the failure of the FBI to provide all of the 302 summary reports of interviews to Congress and their decision to instead provide summaries of the summaries. 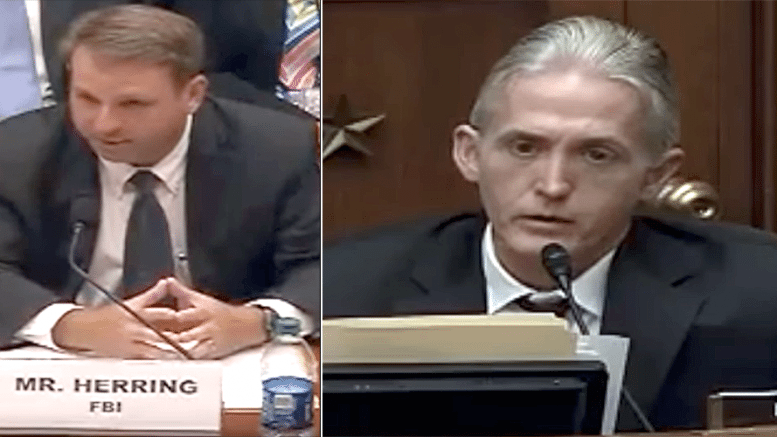 Rep Gowdy does not want the FBI determining for him what is relevant and what is not, noting that he may interpret the content of one 302 differently than Mr. Herring does. Gowdy also takes exception to being told that Congress will need to file a FOIA request in order to be given access to the missing 302s. Anonymous Declares Trump Has Proof The Video With Damaging Audio Is A Forgery!